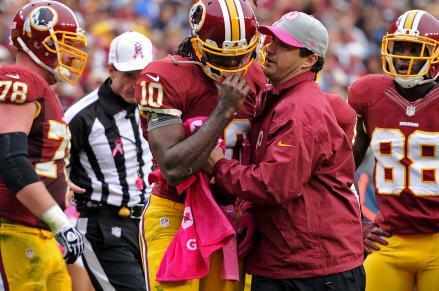 RG3 concussion: Robert Griffin III is the quarterback of the future of the past. Robert Griffin III is the quarterback of the future of the past. Quarterback Robert Griffin III #10 of the Washington Redskins is attended to after taking a hard hit against the Atlanta Falcons. If you’re a Redskins fan or you own Robert Griffin III in a fantasy league, you knew that what happened Sunday was going to happen at some point. You knew that the Shanahans were exposing RG3 to way too much punishment—like a kid playing with a Christmas toy for 20 straight hours—and that Griffin would slide just a hair too late one Sunday and someone would come along and break his Kung-Fu Grip. And lo and behold, here was Falcons linebacker Sean Weatherspoon, delivering the inevitable blow in the third quarter of Atlanta’s 24-17 victory. If it hadn’t been Weatherspoon, it would have been someone else. RG3 now has a “mild concussion” and is already confident he’ll pass the supposedly rigorous tests the NFL gives concussion victims before they return to the field and we all feel OK about it. But if you looked around the NFL yesterday, you saw all kinds of ominous portents for Griffin. The two quarterbacks to whom RG3 is most often compared—Cam Newton and Michael Vick—were bad enough on Sunday that we could start to see what lies ahead for Griffin. Stage 1: Give everyone an erection. ZOMG LOOGIT HIM RUN! AND THROW! AND THROW THEN RUN! No one has ever played QB like this before! Five years from now, every NFL QB will play like this and the position will be totally different! IT’S A REVOLUTION! So long as he doesn’t get hurt. Stage 3: Rack up enough game tape that defensive coordinators start to figure you out. Be sure to express just enough frustration for fans to turn on you and call you a fake. Stage 5: Remake yourself into a pocket passer. Look at him throw the ball away! HE’S SO DISCIPLINED NOW. Stage 6: Screw it, let’s go back to the awesome scrambling. It’s been a whole year since D coordinators have seen this! It’s totally working again! Stage 7: Become a turnover machine. If I hold the ball like I’m passing a beer to a friend across a crowded bar, how could I possibly lose it? But everyone will totally remember how awesome you were those first few weeks. Meanwhile, Andrew Luck—who started the season so meekly in a loss to the Bears—has quickly made the Colts into a nasty little team that’s difficult to beat when playing at home. This isn’t a black QB vs. white QB issue (and let’s all thank Tim Tebow’s God that there’s now a white guy we can adduce to our point). This is a pocket QB vs. hybrid QB issue. Any QB who starts off as a hybrid QB/RB will hit a wall. Always. The NFL will never allow you to escape unscathed when you play that way (and when coaches are stupid enough to force you to play that way). There are too many Sean Weatherspoons waiting for you just as you turn the corner, ready to knock you onto a career path that’s nowhere near as exciting as the one your talent once suggested. And the funny thing is that we always hope there will be one QB who finally arrives who can break the trend, a QB who can survive while doing it all. RGIII looked the part until Sunday, and if he can’t pull it off, I promise you no one can.